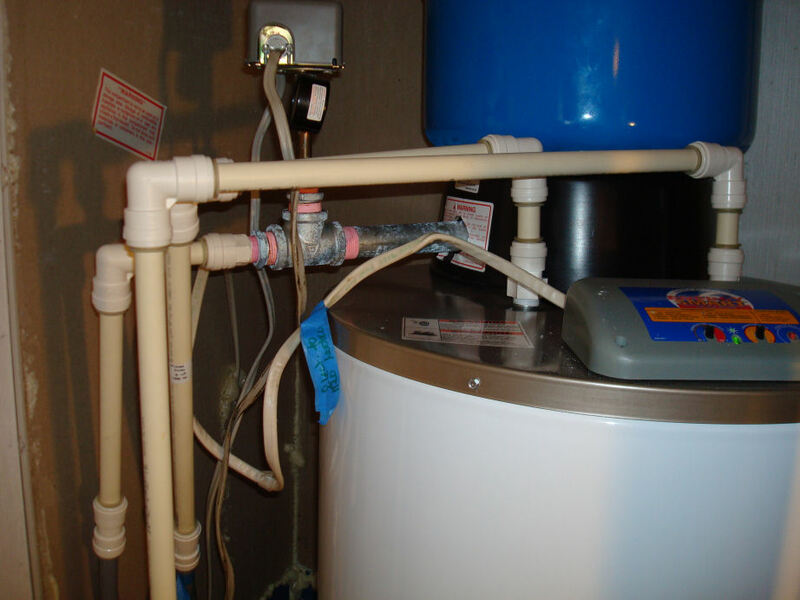 Home Featured Posts We Love Compression Fittings! The difficulty with the plastic tubing comes when you try to add metal fittings to it. It’s tough to get the fittings into the tubing tightly enough, but then you must also clamp it. These fittings and clamps have caused all sorts of frustration during past repairs of existing fittings. Water messes galore have sprung from the backs of tubs, under sinks, and behind toilets. This is no way to do plumbing. We were convinced by wonderful family members that we could have real home fixtures in our mobile home and with the help of these fittings, we have accomplished that. While we didn’t replace all of the water lines (I wish! ), we did replace all of the fittings so far in the projects we’ve done. We would hate to speculate on the status of our marriage right now if it hadn’t been for quick-connect compression fittings! Yes, the fittings we have found to be the best fit for our needs are quick-connect compression fittings. These fittings come in brass and plastic. We’ve used plastic in all of our projects so far and had great success. We can’t begin to express how easy these fittings make each job. Not only are they a breeze to connect and install on pipe/tubing, but they also come in so many configurations that we always found a piece that suited the needs of our particular space and specifications. While I am not a sales person for the company in the video below, nor do I remember the brand of the fittings we used, the ones shown in this video are the same type. We purchased them at Lowe’s and they were all under $8.00. Compression fittings allowed us to take the existing plumbing and make it even better by adding no-leak fittings with shut-off valves. There was no soldering and practically no tools involved. Each fitting slides onto the end of existing tubing or water line and with an easy tug they are snug and leak-proof. It’s pretty obvious that we had a great experience with this product and will use them in our upcoming kitchen remodel as well. However, we understand that there may be disadvantages to using this type of fitting that we just haven’t seen or thought of. If you have had experience with using these in your mobile home, please share your thoughts (good or bad) in the comment area. I'm sorry I don't know anyone in your area who can help with that project. We did the same in our home and had great success. We did most of this job ourselves. If you can find a local manufactured or mobile home store, they may be able to help you find someone who does that kind of work specifically. Good luck with your project. I'm new to MH…in fact….contemplating a MH purchase. Are more recent MH manufactured with shut off valves at water outlets? Retired C-36 Calif contractor unbelievable what the inspectors pass as pro plumbing. 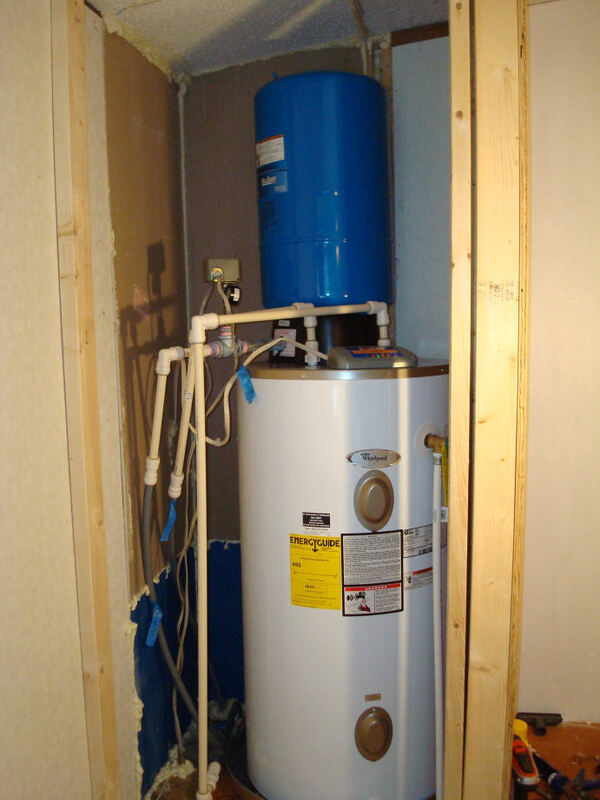 Law of physics tells me 1/2in vent pipe for entire b-room is a joke. To make right would be very costly. Plungers ahoy! I added a pressure regulator,plastic plumbing could not handle 100P,S.I. No house shutoff accessable for my wife for emergencies,installed ball valve,W.H. a joke Is thhere no plumbing union or small lobby to make the code for homeowner. Its all about builders building on the cheap. I am retired and still doing plumbing work,Or. regulations are a necessity Not nazi Germany! Thanks for your comment, Paul, and for visiting our site. 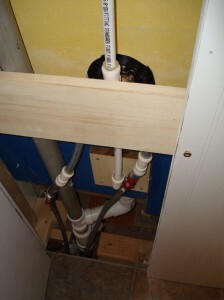 Yes, we have been really surprised at how shoddy the plumbing has been in our manufactured home. We've installed all new fixtures and behind the fixture plumbing setups. The only thing we haven't done is to replace the water line. It is my dream to do this! But, alas, we are getting too….how shall I say?…old :-) to do this job on our own. We just spent the weekend on our knees installing our own hard wood floor, I'm not sure how ready either of us are to climb under the house for days to install new lines, and we're too cheap to have someone else do that job. Oh well. We love the compression fittings (so quick and easy!) 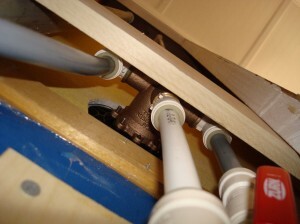 and have also installed shut off valves at every water outlet in the house. We can't even believe they built these homes without them! When it comes to skimping on building materials, the manufactured home industry has been very guilty of that. I am just about to do some plumbing in my second bathroom. I'm SO grateful I saw this first. Off to Lowe's I go. Anyone ever replaced a 32 x 74 door with a standard exterior door? I've read on the internet that it's fairly easy to cut down a standard door to fit the smaller opening. Just wondering if anyone has attempted this? Great website and great information. You are very knowledgeable about this topic and i can't wait until we come back and visit your website again!